Recently I designed an engagement ring for my (now-)fiancée, from scratch. This was a fascinating and challenging process, and gave me a new appreciation for both the art and engineering of jewellery design. We visited a local jeweller, who showed us some designs in similar styles. There were a few features that were missing though; for example, I really liked the gap between the center stone and halo in the vintage ring. For practical reasons I also wanted to design a ring that had a low side profile, as I had nightmares about Heather losing a ring finger in machinery. 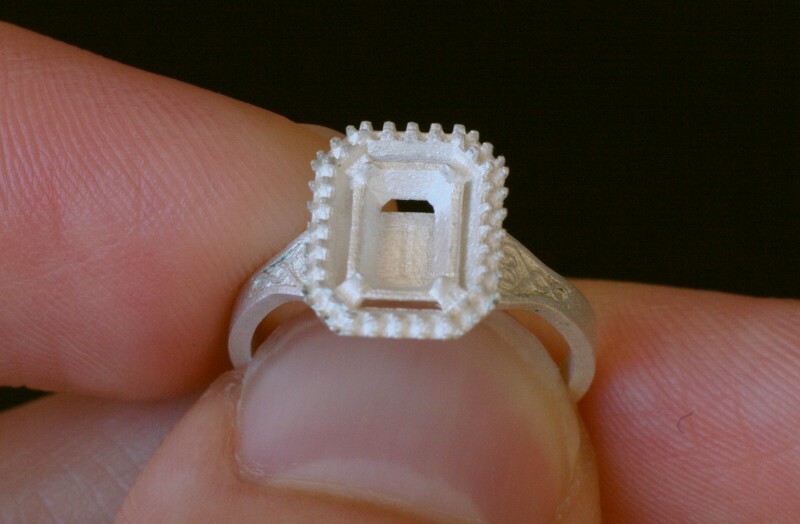 Granted, I’m sure a good jeweller could have designed something fitting the bill, but I had been doing a bit of CAD recently and I thought… how hard would it be to design a ring myself? The final design was manufactured using a lost wax casting process. In this process, the model is first 3D printed in a wax-like resin. A flask is placed around the model and flooded with a plaster-like investment material. Once the investment has hardened, the wax model is melted out, and metal is cast in the chamber that remains. 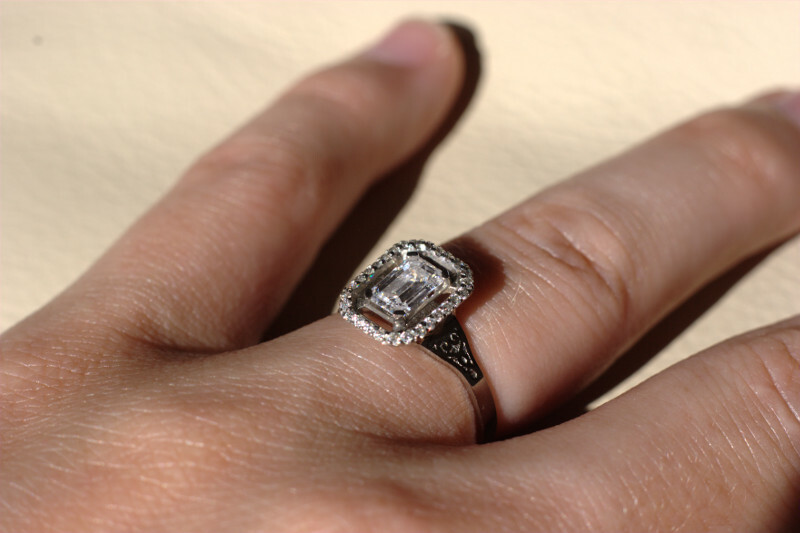 The majority of ring designs use round/cylindrical prongs, but I used rectangular prongs here. I felt that this better suited the angular nature of the emerald cut, and I also think that this shape may be slightly better mechanically (a round prong with the same diameter has less metal, while a round prong with the same area is harder to bend over). Originally I added taper angles to the prongs, but it was suggested to keep them simple and leave finishing details to the setter. The majority of designs use flat or nearly-flat halos, but each face of this halo is inclined outwards significantly (35 degrees). 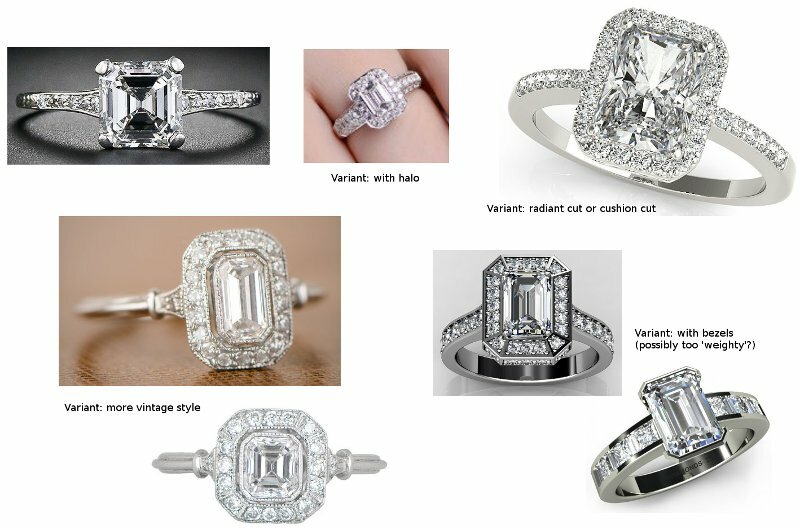 Again, I wanted to echo the faces of the emerald cut, as well as providing a softer side profile to the ring. This means, however, that each of the eight faces of the halo is in a different plane, and this made the placement of the halo diamonds and prongs more challenging. To make sure the dimensions were right, I measured the actual diamond dimensions and angles from macro photos, and built a CAD model of the diamond. I did find a lot of curiosities; for example, I was also expecting the corners of an emerald cut to be cut at 45 degrees, but in fact they were around 42 degrees, and one corner was slightly ‘off’. The key with any gem setting, therefore, is to design in some tolerance. The biggest challenge in the design was the engraving-like design on the shoulder of the ring. I was inspired by vines but, not having the artistic ability to draw vines, I made it more geometric. The final engraving design took all of my CAD knowledge, and some spline mathematics, to implement. Heather and I are both thrilled with the end result. Thank you again to Onshape for building an awesome CAD system, and to Pure Casting for turning my design into reality. First can I say how much I love Onshape. I have no association with the company other than being a user, so you can trust that this is real, genuine puppy love. 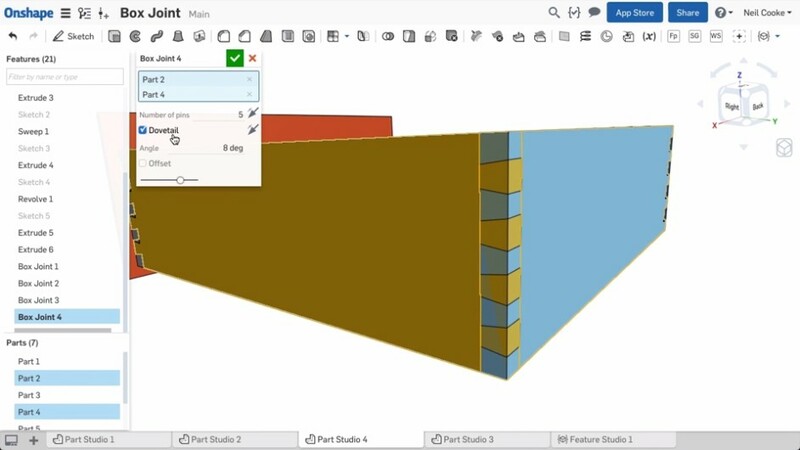 Onshape provides much of the functionality of parametric CAD systems such as SolidWorks in your browser, which at first sight seems like magic. Since I’m a Linux user and the native CAD landscape on Linux is quite limited, being able to do CAD in a browser works brilliantly for me. Even better, it’s free for non-commercial use. 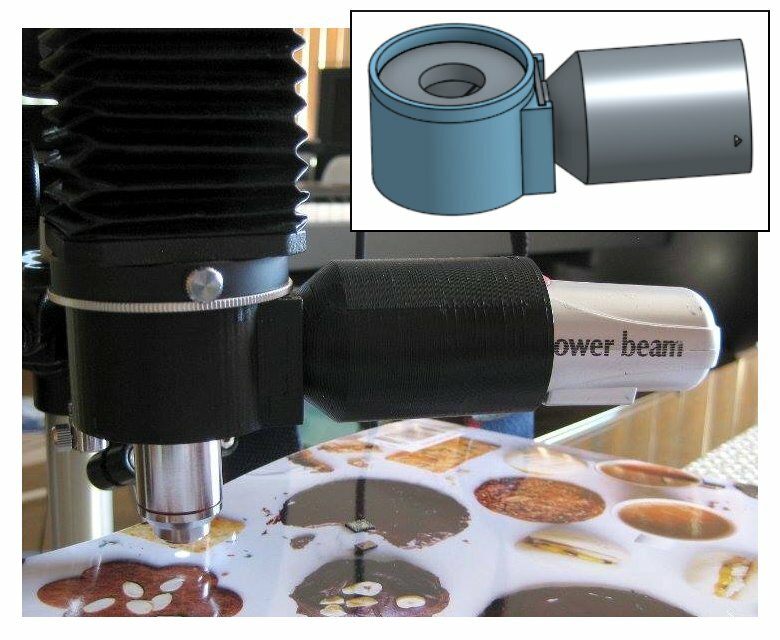 My first little project in Onshape, several moons ago, was a vertical illuminator for my home-brew microscope. The problem I had was that when using high magnifications — which require the lens very close — I couldn’t get enough light in under the lens to illuminate opaque samples. A vertical illuminator is the solution to this problem, sending light down through the lens via a beamsplitter. I designed the physical parts in Onshape, exported to STL format and uploaded to 3DHubs; a local maker printed the parts and within a few days I had it back and working. As a programmer and perfectionist I like the idea of writing code to simplify the CAD process rather than spending hours placing parts in a GUI. Prior to Onshape I’ve used OpenSCAD a few times. But for complex designs it gets difficult to mentally keep track of what’s where without having a live preview, and OpenSCAD rendering can get very slow once you start chamfering, filleting and making things pretty. This is where Onshape and FeatureScript shine. Recently I’ve been doing a bit of jewellery design in Onshape, and this involves a lot of curves and curved surfaces. While I can approximately create the curves I want in the GUI, I wanted to do it programmatically in FeatureScript. Unfortunately a number of the functions that I needed to use were minimally documented so I had to do a lot of trial and error in the process. This article is an attempt to explain some of the missing links for those following in my footsteps. I recently purchased a pair of Dell Venue 11 Pro 7140 tablet computers — one for myself and one for my girlfriend. 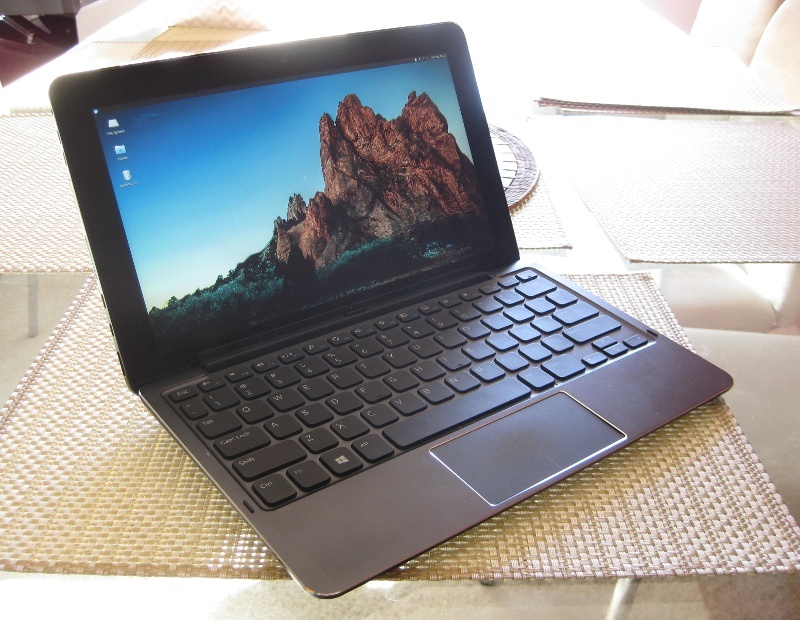 I figured this would be a good crossover device between a tablet and a laptop, and so far I’m not disappointed. One important reason I chose this model is because they are more easily serviceable than other comparable offerings like the Microsoft Surface Pro line; the Surface Pro is glued together in a way that is difficult to disassemble and reassemble, which makes me very unhappy. Batteries have a limited service life (as I know all too well from my last post), and I don’t want to throw away a perfectly good tablet in a couple of years just because the battery is not holding a charge. Even if you don’t have any interest in taking apart your own devices, I would encourage you to consider the fixability of your device and vote with your wallet against throw-away devices. Anyway, enough of that rant. Together with my Dell tablet I bought a keyboard. There’s two types of keyboard available for the Dell Venue 11 Pro: a “slim tablet” keyboard (K11A), which is just a keyboard and touchpad, and a “mobile” or “travel” keyboard (K12A), which additionally has a battery in it. I chose the latter version with the battery inside so that I could get more battery life out of my tablet. If you are just joining this story you may want to start at part 1. Current global food demand growth is ~1.25% pa, while annual growth in supply has been falling and is now only ~1% pa. This means food prices are now rising (after decades of falling food prices). 2011 was a record profit year for US farmers. This is good news for renewed investment in the agricultural sector, but until supply can be increased, the poorest will suffer. Developing countries have by far the largest effect on food demand. Not only are they growing much faster than developed countries, but a much larger proportion of income increases are spent on food. Currently 85-90% of food is consumed in the country it is produced. However, most arable land in Asia is already used, so rising Asian demand will require large increases in productivity per hectare or large-scale food imports. The remaining unutilised arable land in the world is mostly in Sub-Saharan Africa and Latin America. Huge land grabs by foreign investors are occurring as a result. In many corrupt countries, the proceeds are going to the political classes, while the poor get dispossessed (even in those countries with property rights, many poor are not within the land title system). A 2008 Daewoo deal to lease 1.3 million hectares in Madagascar contributed to the overthrow of the government there. Nutrient deficiencies in the developing world are more severe than energy deficiencies (~15% of population in developing countries are deficient in energy, 31% in Vitamin A, 33% in iodine, 61% in iron). Effects of nutrient deficiencies on intellectual development constitute a poverty trap. Governments everywhere need to invest more in research on productivity-increasing sustainable farming methods, which may or may not include GMOs, to avoid excessive monopolisation of agricultural technology vital to food security. Patent reform may be required. One of the simplest solutions for sending measurement instruments up into the stratosphere is a rubber balloon filled with hydrogen or helium. While the physics of such a balloon would seem to be simple, there are actually some interesting considerations.